Himalayan Chickpea is an annual herb, 15-40 cm tall. Stem is much branched, erect, glandular hairy. Leaves are paripinnate with a tendril at the tip. Stipules are leaflike, glandular hairy, margin 5-7-toothed. Leaflets are 6-15-paired, obovate wedge-shaped 4-12 x 3-7 mm, both surface glandular hairy, margin toothed only in upper half, tip mucronate. 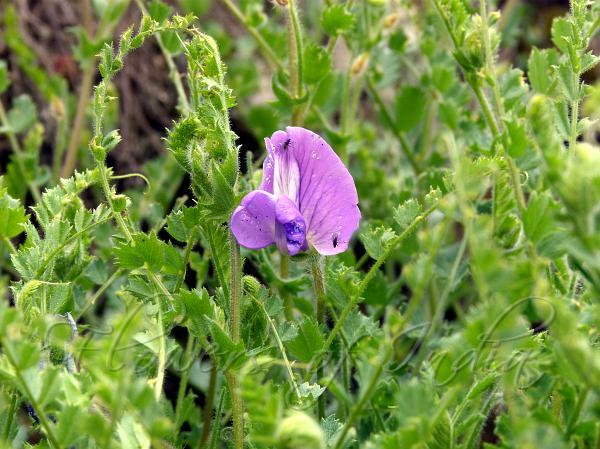 Flowers are borne singly on stalks 0.5-2.5 cm long, glandular hairy. Calyx is about 1.2 cm, deeply toothed, densely glandular hairy. Flowers are blue-purple or light blue, about 2.5 cm. Pod is elliptic in outline, 2.5-3.5 cm, densely white velvety, beaked, many seeded. 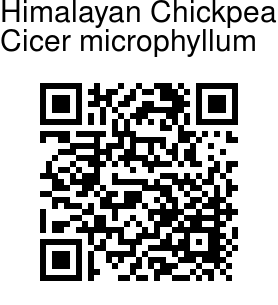 Himalayan Chickpea is found on hill slopes, meadows on sunny slopes, riverbanks, gravels in the HImalayas. from E Afghanistan, to Himachal Pradesh to W Nepal, at altitudes of 1600-4600 m. Flowering: June-August.